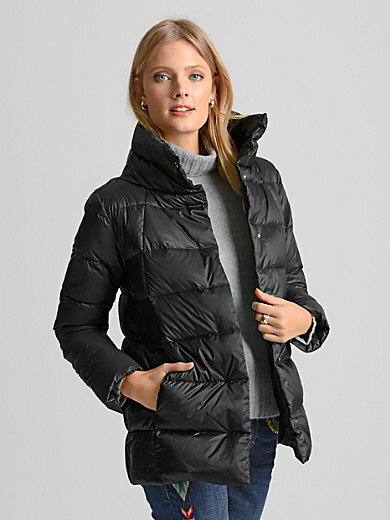 Quilted down jacket by Bogner. An indispensable lightweight piece in a casual silhouette with warmly padded, high stand-up collar. In silky shimmering microfibre with horizontal quilting and an exquisite filling made of 90% goose down, 10% goose feathers which is virtually weightless. Press stud front with corded ribbon underneath, 2 slash pockets in the seam and a practical zipped pocket on the sleeve. Outer and lining made of 100% polyester. Length approx. 27ins. The jacket is machine washable.